Easy to open and close snap lock lid, perfect for even small hands to open with ease. This is the perfect snack size tempered glass food container! Whether it be a granola & yogurt combo, cheerios or even a big puree portion it is perfect for everyone in the family. The nesting feature allows it to store easily with the Sandwich Cube & Wean Cubes. Glass and lid are free from unwanted chemicals including BPA, PVC and Phthalates. 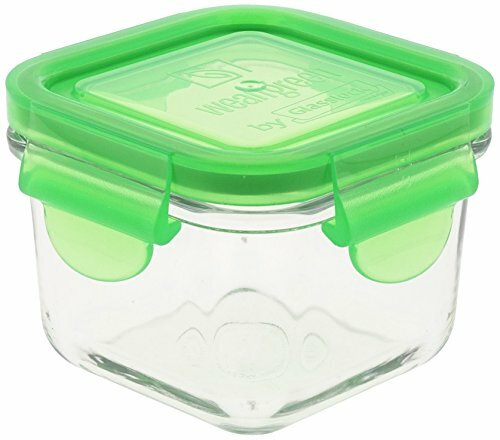 Wean Green offers a safe alternative to storing your families food and snacks in chemical free glass containers. Our eco-chic designs make it possible for parents to choose environmental products without sacrificing style. Wean Green is lalso a proud to partner with 1% For the Planet, an organization dedicated to building and supporting an alliance of businesses financially committed to creating a healthy planet.